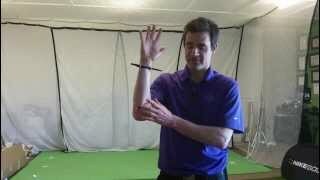 Lead wrist supination is one of the hot new topics in the world of golf science. It's an important concept to examine as training it can fix a host of issues, including a chickenwing style release or poor low point control. However, there are a few pitfalls that golfers can fall into when applying it to their own game. The first pitfall to avoid would be a "swivel" release. This is associated with a lack of ulnar devation or unhinging of the wrists in transition. When golfers apply supination from this unhinged postion, they end up with a steep angle of attack and will struggle with solid contact. Supination and arm extension work in unison and you cannot have good arm extension without properly unhinging. The second pattern to avoid is using internal rotation of the shoulder as opposed to true supination, which occurs at the forearm. When golfers allow for a "roll' of the shoulder to take over, they end up in a similar position to the "swivel" release. This again produces an excessive leftward path and can lead to pulls and contact issues. Finally, the third and most common pitfall that golfers fall into involves the rate at which they create supination. Typically, golfers who are first learning this movement will try to apply it all at once as they come into the ball. This leads to a flip release and consistency issues. We know that for touring professionals, their supination starts earlier in the downswing and moves at a much slower rate than the average golfer's. This creates consistency as the rate of clubface closure is more constant. So, if you are struggling with this, make sure that the body is continuing to rotate through impact and that the maximum amount of supination is occuring later in the release and not just at the ball. 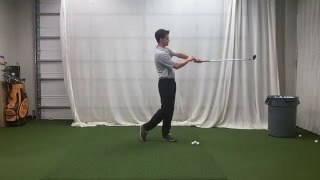 Connecting Unhinge To Body Rotation If you try to hold the club up, you will slow your ability to rotate. What Is Supination? In this video, I show you what supination is and how it is measured.